Roma people mark its International Day today. Throughout the Balkans, pushed on social margins, and not being integrated in regional societies, this vulnerable community face poverty, stigmatization and an unpredictable future. 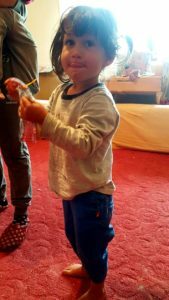 The KoSSev team visited the Abazi family from the Roma community living in North Mitrovica on the eve of International Romani Day in order to learn firsthand about their living conditions and problems. Vucitrn-born Besnik Abazi is currently living with his wife Zejnep and their five children in an unfinished house in North Mitrovica. The house is sparsely furnished and one of the many abandoned houses in Kosovo. Besnik told KoSSev that they do not know who the owner is, still adding that they have „received permission“ to reside in it for now. “When we moved in we had nothing, but someone occasionally calls and gives us a bed, a carpet, and we managed to settle here,” said Besnik, father of seven-year-old Mevlana, Elmedin, Sultana, and one-year-old twins – Selmedin and Eldesin. The children welcomed the KoSSev journalists barefooted, wearing thin clothes and with a cold, but still cheerfully running over the damp half-covered floors and rejoicing at the toy trucks and cars our team brought for them. They skipped from one room to another – multi-purpose rooms where guests are welcomed, the children play and the place where the family sleeps beside two wooden baby cots for the twins. The house is freezing, as the cold penetrates from the concrete, earth, bad windows, and unfinished rooms on all sides. „Spring has come and now it’s warm. We barely survived this winter,“ Besnik stressed. According to him, the greatest problem is the fact that he is not employed and does not have a regular job and salary which would greatly help his family. „I support my large family by working with iron, recycling and collecting secondary raw materials. 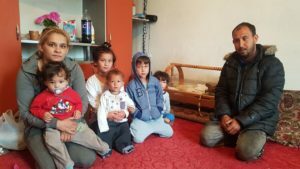 These five children have to be fed and the conditions in which we live are poor,“ the head of the Abazi family stated, whose only income is everything Besnik collects and sells at the end of the day. He added that his earnings depend on the day. Sometimes he earns ten euros, although five or six euros is the average. There are days, however, when Besnik earns nothing. He described his job as „difficult“ because everything depends on how much of the „raw material“ he finds. The Abazi family does not receive any form of institutional support, they are not on Serbian or Kosovo welfare because they are registered as residents of Vucitrn municipality. They cannot register in Mitrovica because they do not have a house of their own. Besnik told KoSSev that he sought help from the municipality several times but it did not bear any fruit. 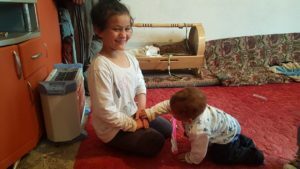 A special problem for the Abazi family is that they cannot obtain documents for the eldest girl, Mevlana, who is now seven years old and who is supposed to enroll in the first grade of elementary school. „She has no Serbian documents, only Kosovo birth certificate because she was born in Vucitrn. My wife did not have a Serbian ID card at the time, so we did not even enroll her,“ Besnik said. On the other hand, the rest of the Abazi family has all documents and certificates and citizenship. „I want my children to go to school. I went to school as well. I want even better things for my children and I know that school is the most important thing,“ this young father of five underlined. „The worst thing is that nobody comes to ask you how you are doing, in what conditions you are living in, including the uncertainty of what is waiting for you tomorrow,“ he stressed. „No one cares about us, they do not see us, I cannot do anything regardless of where I go and ask,“ he said. Besnik is aware that the problems faced by the Roma include lack of interest and concern by the community and society, lack of institutional support, and the inability to exercise basic rights related to personal documents. International reports often register administrative problems of Roma, Ashkali, and Balkan Egyptian communities – cases of not registered at birth. UNICEF indicated that lack of registration could adversely affect a child’s access to social assistance, particularly for repatriated children. Children who were not registered were considered stateless. The same reports also state that members of the Roma, Ashkali and Egyptian communities are still the most endangered and most marginalized communities in Kosovo, experiencing pervasive social and economic discrimination. While escorting us to the door for the farewell, Besnik’s wife Zejnep shyly added: “I know you, you are living nearby here in the street”. How important it is to look around oneself and pay attention to neighbours, those ones in the greatest need – we, almost embarrassed, thought while thanking the Abazi family for receiving us in their wished-to-have home. Besnik and Zejnep Abazi needs assistance to register their eldest daughter Mevlana and place her in school. Perhaps this story may serve as a last minute alert to the numerous institutions in charge and CSOs providing free legal assistance to the Abazi family.